From left to right, Vanessa Lucier, Lars Lund-Hansen, Remo Cossu, Ian Hawes, Biran Sorrell, Bibi Ziersen, and Alexander Forrest. In the foreground are the Gavia AUV and the ROV that we used in support of Gavia operations. Ian Hawes and his team have a very hard job. 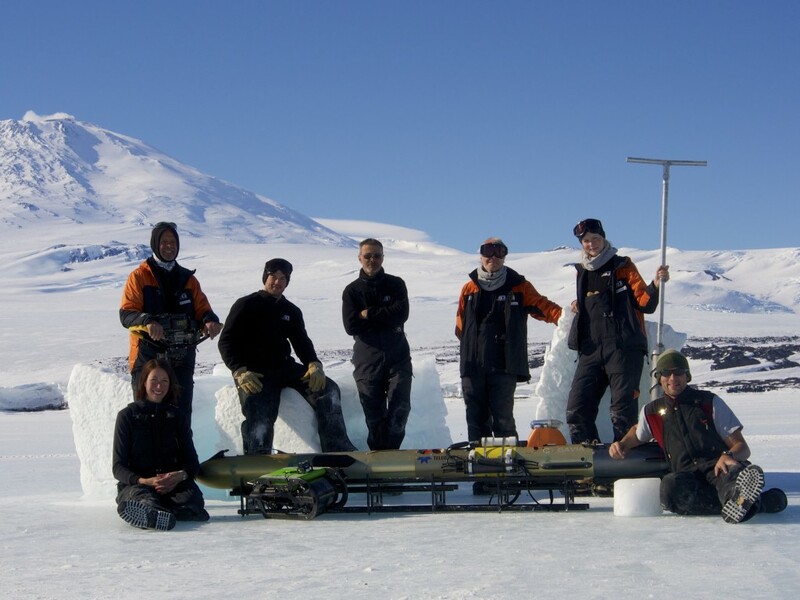 Along with colleagues from Aarhus University and the University of Tasmania, the University of Canterbury lecturer is using underwater drones to map ice algae in Antarctica. Sea ice is one of the defining components of the polar marine environment and primary productivity associated with sea ice can be vital to biological systems. Every spring, when daylight returns, algae begin to grow on the underside of the ice and these ice-algae support a complex system of herbivores and predators. It has been estimated that ice algae contribute 20% of primary production in some polar regions, at a time when few other resources are available. While we know they are important, ice algae are patchy and easily disrupted and the traditional sampling methods, based on ice coring, struggle to quantify biomass on more than very local scales. We need better tools, and this year we took an autonomous underwater vehicle – an underwater drone – to Antarctica and used this to estimate of ice-algal biomass. To do this we used the principle that ice algae absorb some, but not all, of the light spectrum, and that the more algae there is in the ice the greater the effect on the colour of light penetrating the ice. By fitting the vehicle with wavelength-specific optical sensors we are able to produce high resolution maps of ice-algae, while upward-looking sonar can measure ice and snow thickness. Such maps can help us to better quantify algal understand the factors controlling their dynamics. Developing such tools opens up sea ice studies to non-disruptive and broad scale data acquisition and as the suite of such tools becomes more robust our ability to understand sea ice dynamics and ecosystem properties, and to predict responses to changes in ice cover, will steadily improve.